You are currently browsing the archive for the food category. A few pictures of things we’ve done over the last few months. 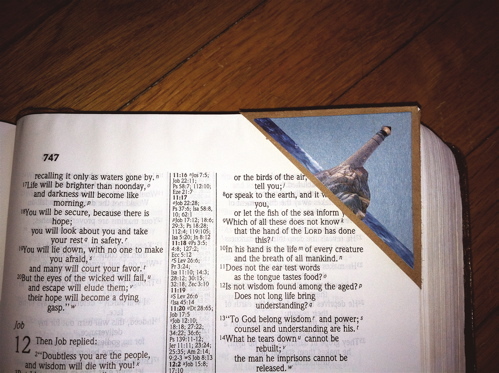 For Valentine’s Day we made corner bookmarks like this lighthouse one I made for our dear neighbor E. I cut 2.5 inch corners off of envelopes (red ones left over from Christmas cards were especially useful) and then attached 2 inch triangles of a different color or patterned paper to each side. The kids had fun mixing up colors and decorating with stamps, stickers and cut-outs from magazines and catalogs. We found the nursery/seed catalogs and the quilting fabric catalogs to be gold mines for this activity. You can find instructions for a similar corner page marker here at Tally’s Treasury. 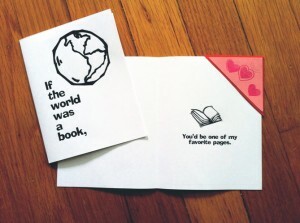 Then we stuck the bookmarks into these Valentine cards. I think I made up this sentiment myself, but it’s possible I heard it somewhere. In any case I found some free clip art online and made this card. I printed out enough copies for all the students in both of the kids classes and they colored and decorated as desired, making each one special for the recipient. I’m including links to the printable pdf version here if you’d like to use it, just print on cardstock or regular paper, fold in half and in half again. 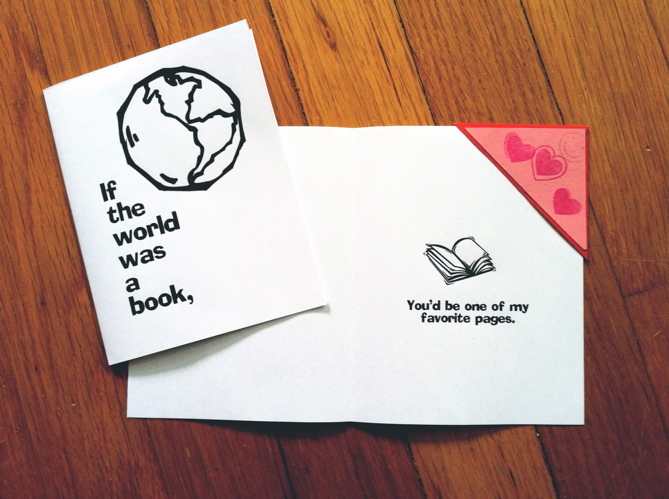 original Valentine’s Card. And the write-your-own-occasion card pictured above. 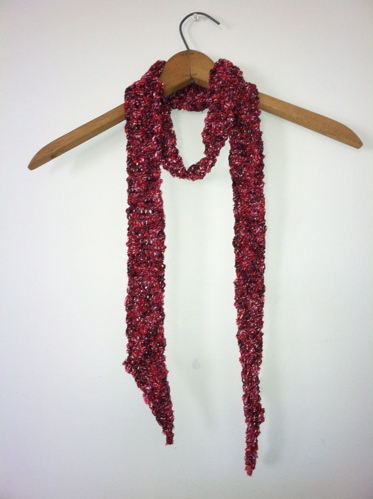 I knit several skinny scarves out of novelty yarn. 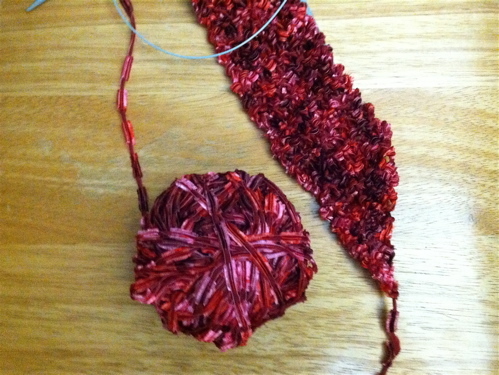 This is the sort of yarn that looks pretty or fun but you really don’t know what to do with, or at least I don’t. But I finally figured something out that is easy to make and looks good. With extra large needles, I knit loose garter stitch scarves about 3″ wide with a single ball of novelty yarn, about 75 yards, for a long accessory scarf that can wrap around the neck and hang down fashionably. These won’t keep you warm at all but they are fun to wear. Rather than making a blunt end I figured out how to increase and decrease to make tapered ends that give a little extra finishing touch. My construction notes are on my project page in Ravelry. The subject of gems and crystals came up and on the way to explaining how crystals grow, I decided we needed to do an experiment. This falls under the category of what I call kitchen science—real experiments you can do with stuff you already have around the house. 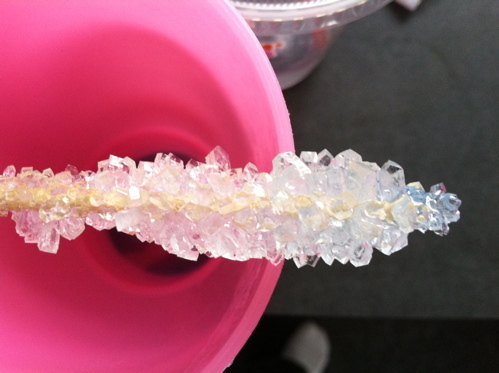 Even though I know I’ve done this before, it took two tries to produce a sugar solution that grew several of these rock candy sticks. I used the instructions from About.com. Our crystals did not retain either the flavoring or coloring that we added to the solution. Nobody complained when it came time to eat them. I cannot remember why we did this but we had fun. The girl and I picked pansies out of the garden to make some smashed flower art. 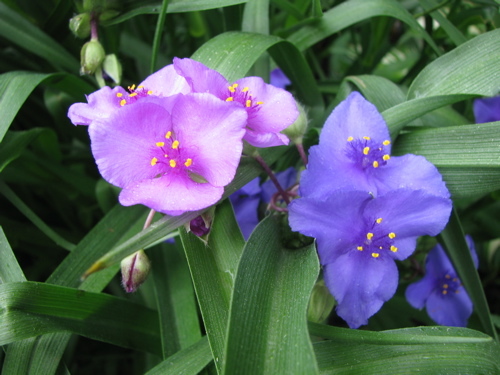 The colored juices from the plant are transferred to soft paper by force. I used some bookmark sized pieces of heavy paper left over from another project. We used a regular hammer, sandwiching the flower face down on the paper between a piece of paper towel on top and wax paper on the bottom, on top of a scrap piece of wood. 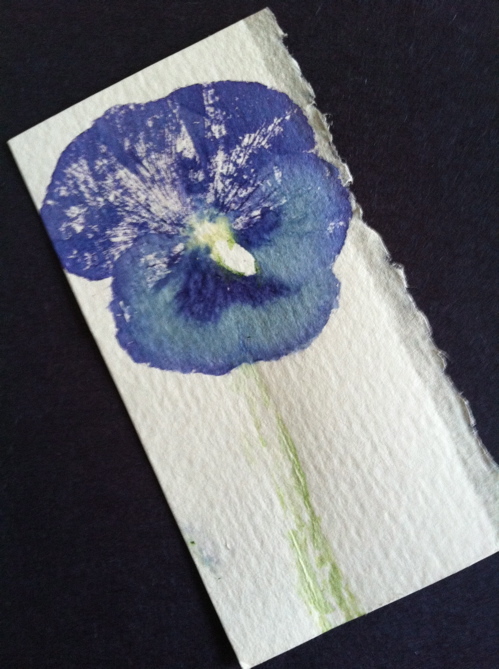 I cut the green fleshy calyx off the pansy with sharp scissors after positioning it on the paper. 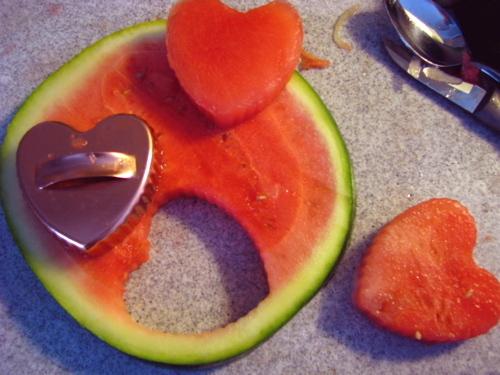 You could use this technique to make cards, placecards for a summer meal, or even art to frame. Get more details on how to make prints from botanicals from this great post by Wendy of Build/Craft/Make/Bake. Too bad I read her post after we did this project but there is plenty of summer and plenty of blooms yet to try! 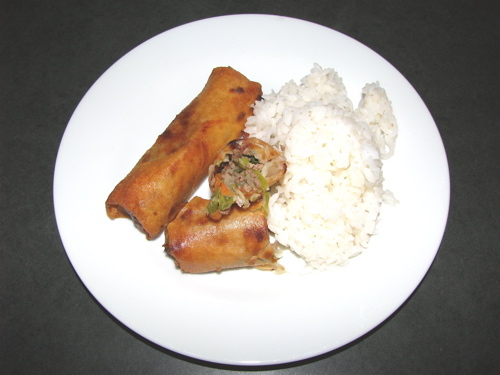 I think my mother learned to make lumpia from Filipino ladies whose husband’s were stationed on the Navy base in Iceland at the same time we were there. 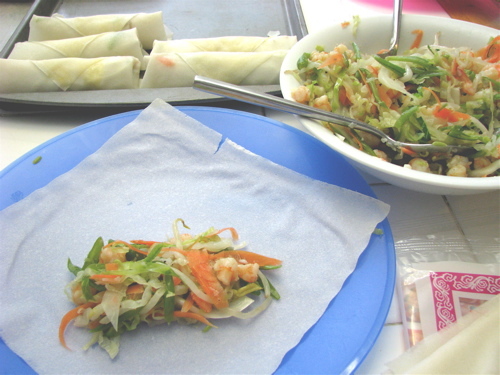 The filling is made of various cooked vegetables and ground meat wrapped in a thin wrapper almost like a crepe and then fried quickly in hot oil. As a child, I remember it was difficult to buy the wrappers and the packages had likely been frozen and thawed more than once. The paper-thin wrappers were often stuck together and it was my job to carefully peel them apart and hand them out to the adults who rolled the filling into the wrappers. A few weeks ago my parents came down to see us and my mother cooked up a big batch of filling and three of us rolling made quick work, allowing us both to stock pile carefully bagged lumpia in the freezer for later enjoyment. The total amount of cooking time is approximately 10 minutes. Cool and drain the filling. 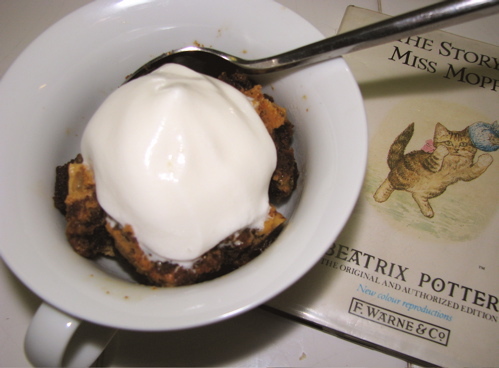 Place 1.5 to 2 tablespoons of filling on a wrapper and bring up the bottom corner first. 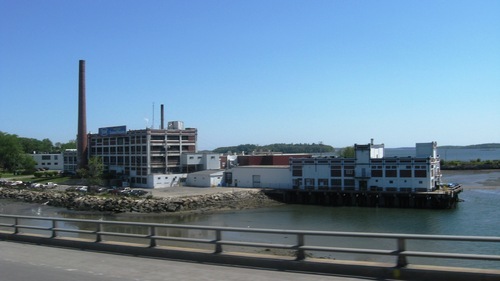 Fold in the sides and roll. Brush the last corner with beaten egg to seal. To cook, heat two inches of oil in a heavy pot until a dry chopstick bubbles when dipped in the oil. Have a cooling rack of paper towel covered tray ready for the hot lumpia. Gently slide lumpia into the hot oil, turn as necessary to fry evenly to golden brown. Remove to rack to cool slightly before serving. I usually cook 4-6 per adult. Two per adult for an appetizer. Then I decided to do a search on the term. Apparently the dish I have been calling shrimp en brochette for at least 15 years is only somewhat related. En brochette is French for food that is cooked and possibly served on a skewer. Generally that means grilled. And in the case of shrimp, at least here in the United States, it is accompanied by bacon, jalapeño pepper and cheese. There was a little restaurant in Oklahoma City in the early ’90s called Pearl’s and they served up New Orleans style food and music. On our working part-time through college budgets we still managed to go a few times and enjoy their gumbo and shrimp en brochette. Here’s my home-cooked version of what Pearl’s called shrimp en brochette. 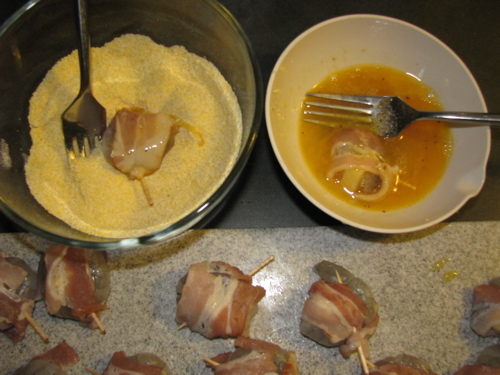 I put the cheese in the middle of the curled shrimp and then wrap the bacon around and fix with a toothpick. You can also butterfly the shrimp and insert sliced cheese. 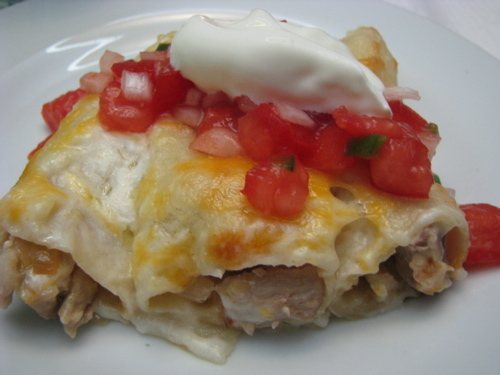 Some recipes also call for a little strip of jalepeño with the cheese. I’ve never tried that and I don’t recall that Pearl’s put it inside either. Prepare one bowl with a beaten egg and a bowl with about 1 cup cornmeal, 1/2 cup grated parmesan, salt and pepper. 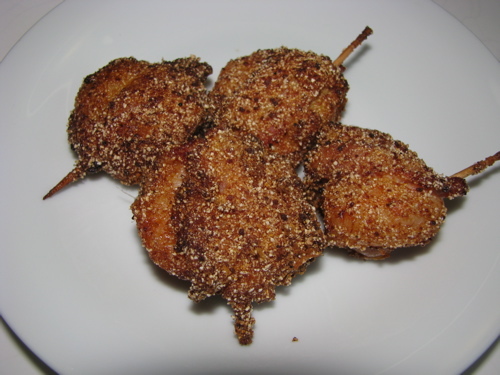 Coat your skewered shrimp first in the beaten egg and then in the cornmeal mixture. 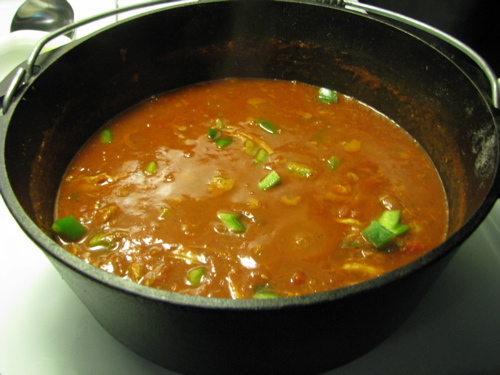 Heat oil in a deep skillet or dutch oven. Oil should be hot enough to make a dry chopstick release air bubbles. Have a metal rack or paper toweled plate ready. Lower the coated shrimp into the hot oil. It will only take a minute or two to fry to a nice golden brown. Remove to rack and allow to cool a bit before serving. Make sure to remove the toothpicks or at least warn your guests to do so! Pearl’s served these with a cherry horseradish sauce which I’ve never tried to make, but I would guess it was similar to basic cocktail sauce but with puréed cherries and possibly tiny diced jalepeño, instead of ketchup or in addition to ketchup. 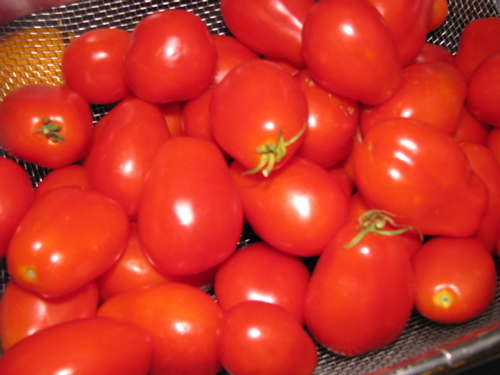 This is really too rich to eat as an entrée but it makes a tasty appetizer or a light addition to rice or a large salad. 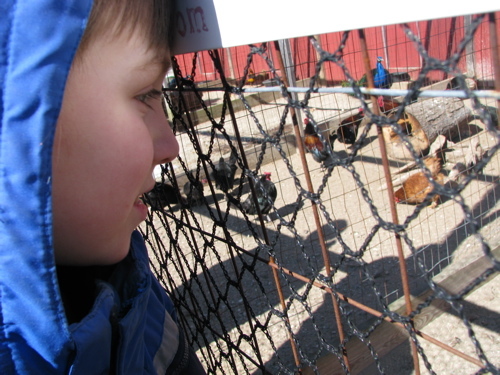 Area farms that make maple syrup open their gates to the public on the last weekend in March around here. This was the first year that we were able to make the timing work. 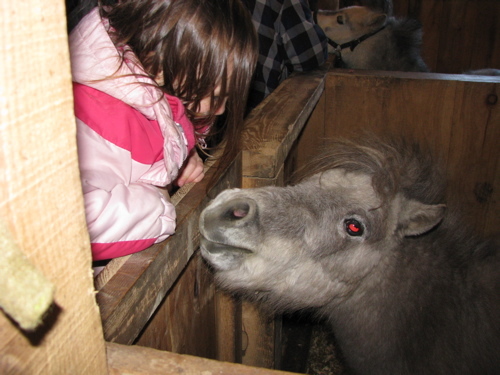 Having recently watched a horse movie, we chose to visit the Cooper farm where they raise miniature horses, creamy white Charolais cattle, and a number of exotic birds as well as tapping their maple trees and keeping bees. 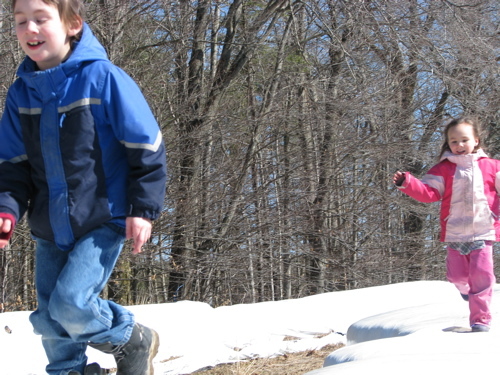 The air was crisp but sunny and we enjoyed the walk around the farm squishing our boots through the Maine mud and ending up in the warm, steaming sugaring house, drinking in the smells of wood smoke and maple sap cooking down into syrup. 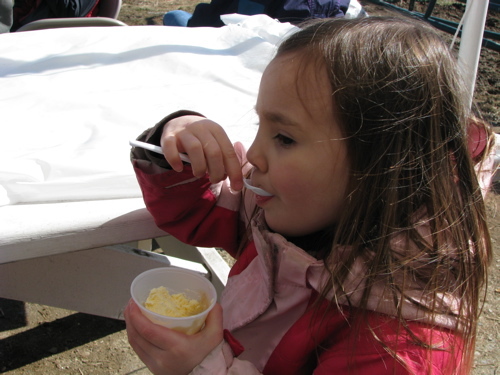 A sampling of maple syrup drizzled ice cream provided the happy ending. We brought home powdered maple sugar, some maple cotton candy (the only kind of cotton candy worth eating), and local honey. The boy’s class had an Arctic Celebration this evening complete with readers’ theater, songs, artwork, games and snacks, and surprise—snow—so appropriate to the theme and late March in Maine. I had volunteered to bring something baked and at the last minute (not a surprise) I decided that I just had to make polar bear shaped shortbread. Had to. 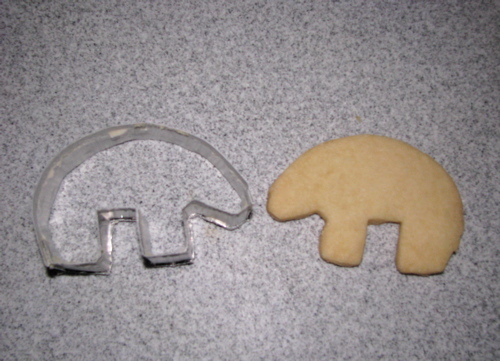 A piece of aluminum roof flashing, a pair of pliers and a few minutes of careful bending yielded a serviceable cookie cutter in a graphically simple shape of a polar bear reminiscent of Inuit sculpture. The boy helped me make the simple shortbread dough and we had just enough time to bake the bears before heading off through the snow to see his classmates and their families at the school. Once or twice a winter when we get a nice big snow I collect a bowl of clean snow and we pour in some milk or cream, a little sugar and some vanilla. Stir it up and you have snow cream. The first time we made it I was surprised how good it tasted. Or maybe anything sweet tastes good after you’ve been running around outside. 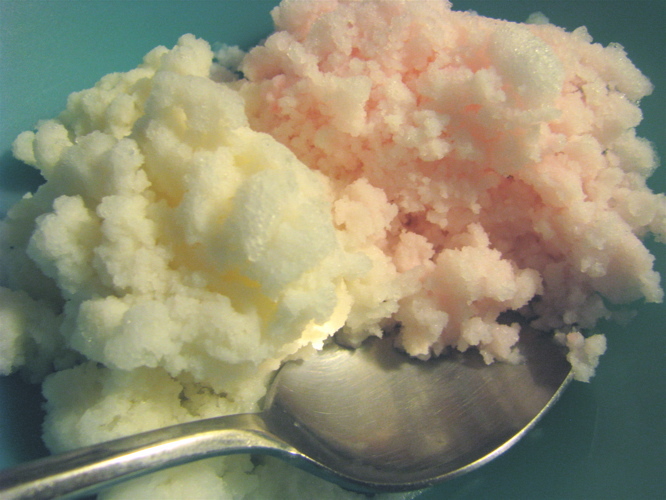 The pink snow cream was flavored with just a drop of cinnamon oil and was highly favored by the boy and me. Surprisingly the girl preferred the plain vanilla despite her general preference for all things pink. I haven’t been posting so much lately. I’m not really sure why. I thought I would have more time to myself with the girl in afternoon kindergarten. It doesn’t seem to have worked out that way. But I suppose I have been able to volunteer at both of the schools. 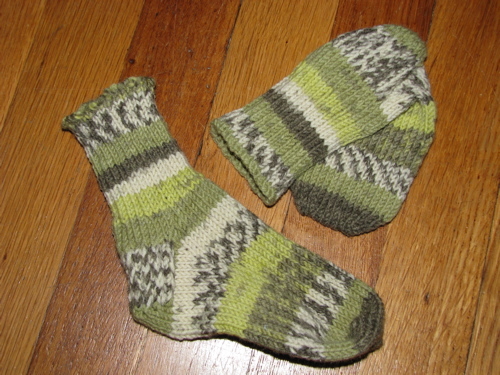 This is the second pair out of the same ball of self-striping yarn. Matching socks for the boy and his sister. 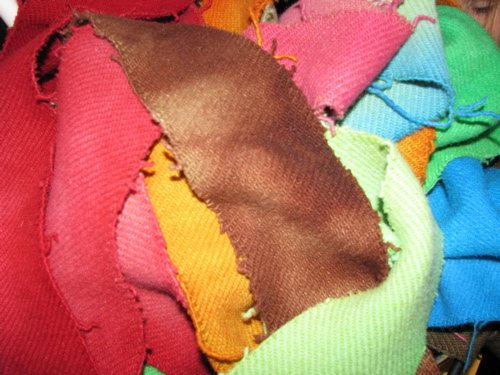 These are scraps of an old wool blend blanket that the boy and I dyed various colors. It was originally a light green and the boy had a great time seeing what would happen when we overdyed with various colors. It took the dye fairly well but unfortunately it did not felt well. That may change the intended use. 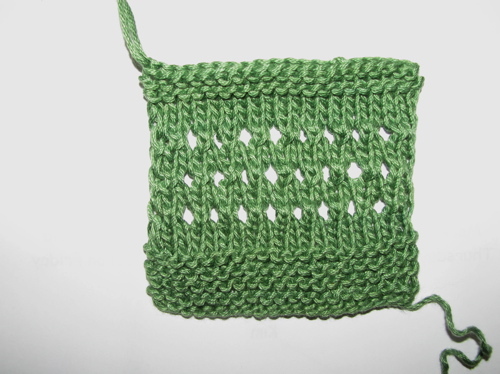 Swatch of eyelet lace border that I originally improvised for the strangling vine lace scarf. Someone on Ravelry saw my project photos and asked about the border. I had already gifted the scarf so I had to look at the photos to try and figure out what I had done. I hope I got it right. Although the pattern is quite simple, I have a hard time remembering to stop and write down what I am doing. Probably why I didn’t write it down in the first place. So my Ravelry notes for this are now out there and I really hope there aren’t any mistakes for the sake of anyone who may try to knit from them. 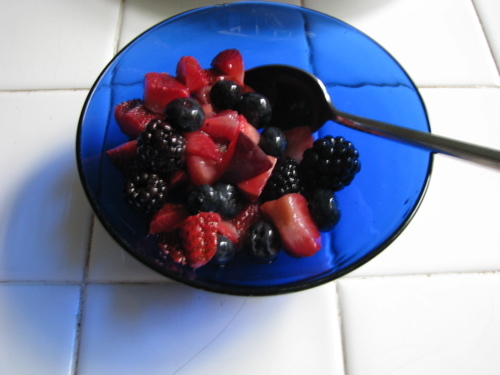 This one because you need a food photo don’t you? 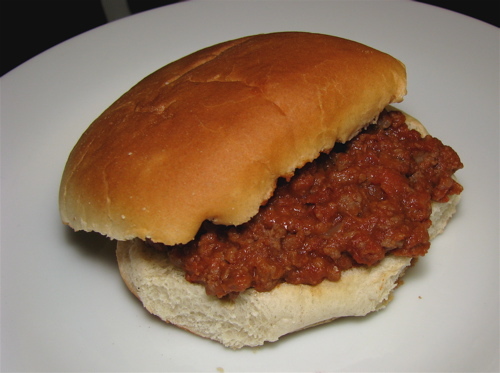 Recently I have made chili with pulled chicken instead of beef in it and I like it very much. I use poached chicken thighs and pull the meat apart with two forks. And I always put the diced green pepper in just before serving so they stay nicely crunchy. 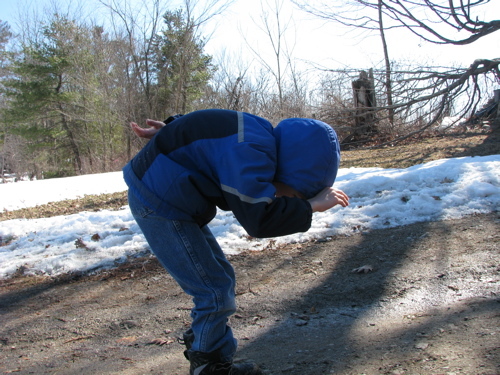 My friend Krista mentioned a website, candyexperiments.com, that gives suggestions for using candy to do simple science experiments with kids. (Check out Krista’s pictures, she must have been a lot more organized than I was.) The catch of course is to get your kids to willingly give up their candy right? We’ve done some household science experiments before so I knew that would be a good draw. I explained to the boy and his sister that they could each pick out 5 pieces of candy and then we would do science experiments with the rest of it. The boy looked thoughtful for a moment and then readily agreed. Sister followed suit. I pulled out several heavy clear glass bowls, a bunch of spoons, cold water, hot water, baking soda, salt and lemon juice. The best part is the stirring of course. We tested to see what temperature of water dissolved candy faster. 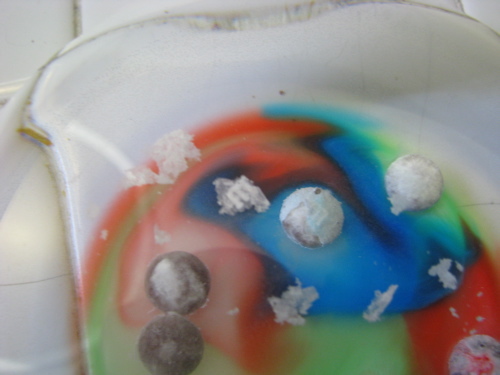 We used baking soda to test which candies were acidic (acid plus baking soda equals bubbles.) We dropped hard candies into boiling water to watch them crack. We all made a guess on which candy might float and then tested to see who was right. The girl picked Charleston Chews, because they are white in the middle. I don’t know about her logic but they did indeed float! We were also surprised to find that the addition of salt to one of the bowls of candy made the candy corns pop up to the top. 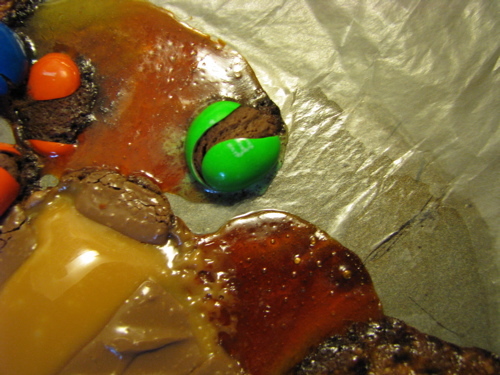 We also put a bunch of candies on a cookie sheet and watched them melt, crack open, and even change color in the oven. We were surprised to see that candy corn melts, bubbles and then turns transparent and cools into a hard glassy puddle. It was all rather chaotic, and the candy disappeared faster than I would have guessed. I managed to save some M&Ms for one particular experiment found on candyexperiments.com. I started with a clean bowl of water and very carefully dropped in different colors with the “m” face up. It was hard to be patient but we were rewarded with a rainbow of colors as the candy shells dissolved and the neatest trick of all: the white “m” floated up to the surface of the water! About three times over the course of the last few months. All from three roma tomato plants. 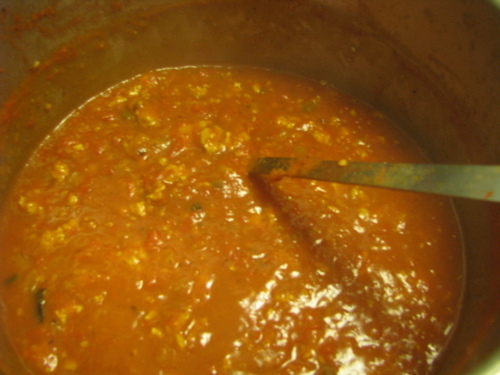 I was also able to throw in our own parsley and chives into several batches of tomato sauce. And I even added some puréed squash to the last batch. Next year I’ll be looking for one of those handcranked tomato presses. 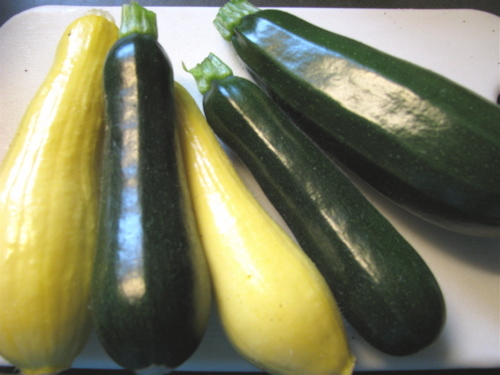 The zucchini and the cucumbers didn’t produce much, maybe the heat? And an unknown visitor kept sampling the beans, but otherwise we had very little problem with pests. Fresh mint and dill made it to the table quite a few times, mmmm. We haven’t had a really hard frost but enough to wilt most of the tender garden. 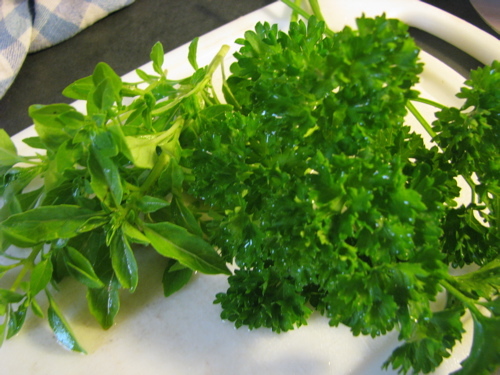 The parsley will produce until it gets buried in snow. 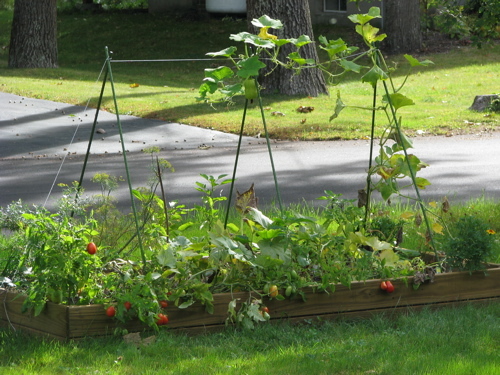 This is the first year we’ve had a garden in several years and I’m looking forward to next year already.